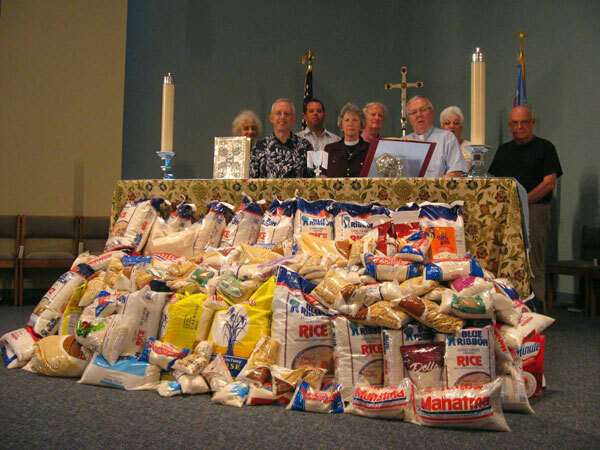 The rice will be distributed equally between The Episcopal Refugee Network and Interfaith Community Services. Left to right: Louise Lawson, The Rev. Fred Thayer, Greg Tuttle, The Rev. Judith Allison, Blair Lawson, The Rev. Jim Kellett, Nina Zettinger and The Rev. Bill Zettinger. Not pictured is Pippa Mills who was on vacation.